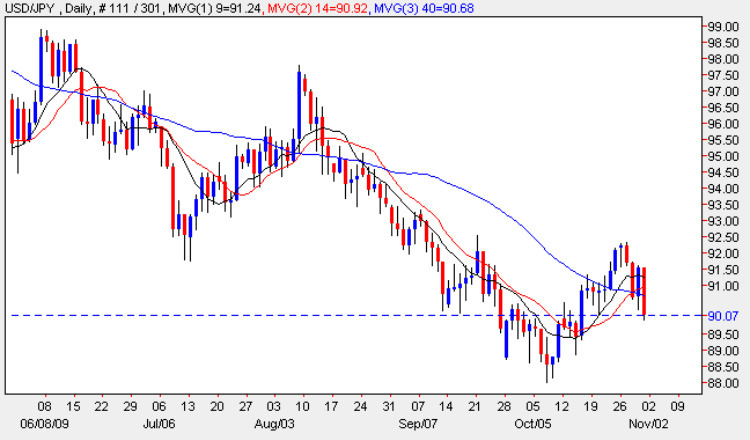 The yen to dollar pair ended the trading day and week in dramatic fashion with a wide spread down candle which breached all three moving averages reinforcing the bearish sentiment in the currency pair at present, and confirming with some style the hanging man candle of the start of the week. In addition the low of the day broke below the minor resistance at $90.50 and confirming that the recent rally of the last few weeks is unlikely to continue, and as a result we may now see the yen to dollar pair retest the next support region in the 88.50 price point once again. However, with the Bank of Japan sitting in the wings it will come as now great surprise to see them intervene once again and we may see a double bottom on the daily chart formed as a result in due course. In the meantime, with the bearish engulfing candle of Friday now firmly in the picture we should see the yen to dollar pair fall in the short term as a result of this technical signal.